As part of the Camden Coalition’s ongoing quality improvement efforts, we evaluated our 7-Day Pledge program to learn about the relationship between timely follow-up appointments with primary care and avoidable readmissions. 7-Day Pledge is a citywide program to reduce hospital readmissions by facilitating primary care follow-up appointments within seven days of patients leaving the hospital. We do this by engaging directly with patients and primary care providers to reduce well-known barriers like difficulty scheduling appointments and transportation, and we provide enhanced reimbursement to providers to prioritize patients recently discharged from the hospital. The results of our analysis were published today in JAMA Network Open. We compared patients who had a primary care follow-up within seven days with patients who had similar clinical and demographic characteristics but who had a later or no follow-up appointment. 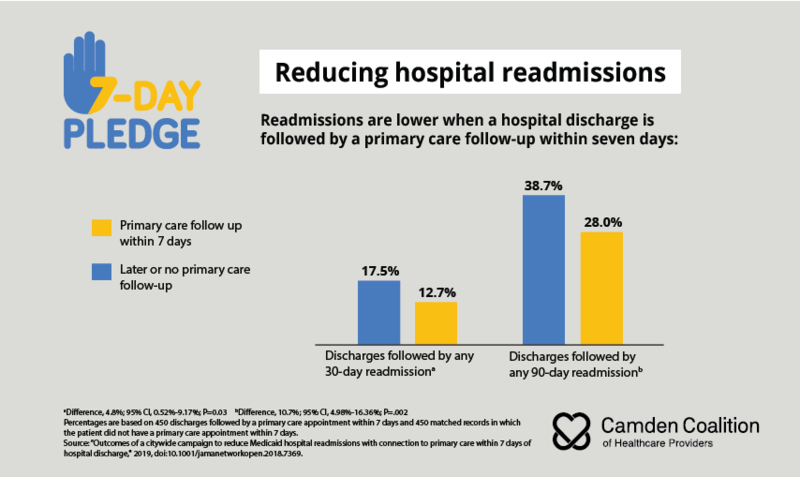 We found that patients who had primary care appointments within seven days of hospital discharge had a lower number of 30- and 90-day hospital readmissions. Our evaluation highlights the importance of timely primary care follow-up appointments and shows the value of collaboration. The 7-Day Pledge relies on our partnerships with primary care practices in and around Camden, including: CAMcare, Cooper Ambulatory Pediatrics, Cooper Internal Medicine, Cooper Family Medicine, Fairview Village Family Practice, Osborn Family Health Center, Project H.O.P.E., Reliance Medical Group, and Virtua Primary Care. As Camden Coalition Health Information Exchange participants, Cooper University Health Care, Jefferson Health’s three New Jersey hospitals, Lourdes Health System, and Virtua Health provide us with the data we need to run the 7-Day Pledge. Now that we know that rapid connection to primary care helps lower readmissions for a general adult population, our next step is to learn more about which patients will benefit most from the 7-Day Pledge. This will help us target our work so we can help people most effectively and provide a return on investment. Read the results of the 7-Day Pledge evaluation in JAMA Network Open. Read our 7-Day Pledge quality improvement brief outlining our evaluation results. Read our 7-Day Pledge clinical redesign brief to learn about the citywide partnership that powers the program.